Blending a favored wide-angle focal length with a bright maximum aperture, the EF 24mm f/1.4L II USM is a Canon L-series lens characterized by a robust physical construction and sophisticated optical design. Two ultra-low dispersion elements help to control chromatic aberrations and color fringing while a pair of aspherical elements reduce spherical aberrations and distortion for high sharpness and clarity. Individual elements also feature a Sub Wavelength Coating to suppress lens flare and ghosting for improved contrast and color neutrality in a variety of lighting conditions. Besides the optical attributes, this lens is also distinguished by its fast f/1.4 maximum aperture to benefit working in low-light conditions for controlling depth of field. Additionally, this lens sports a ring-type USM for quick and quiet autofocus performance and full-time manual focus override, and an internal floating focus mechanism also helps to maintain consistent image quality throughout the entire focusing range. 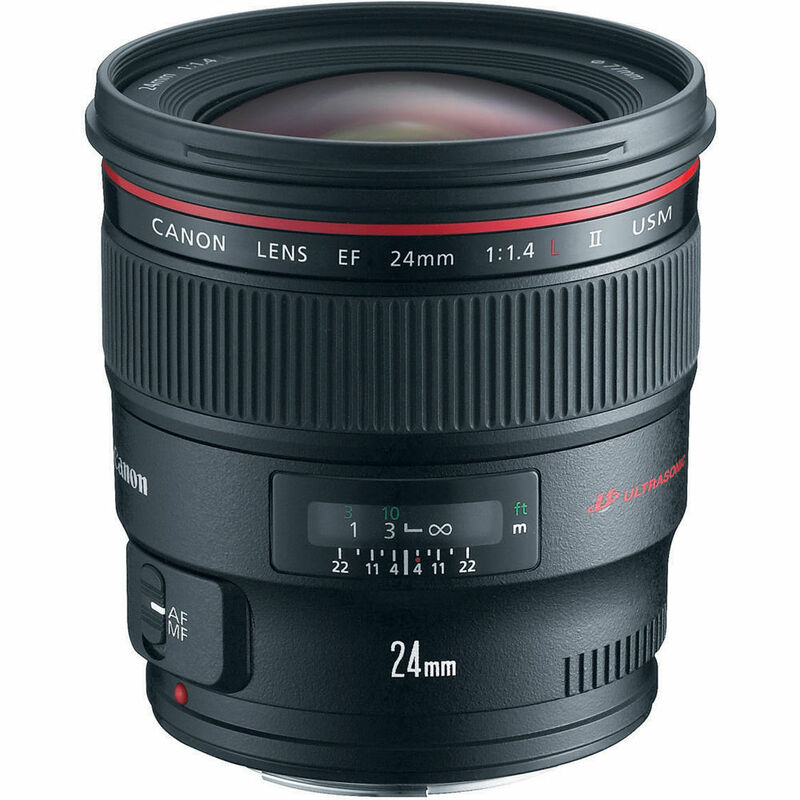 Wide-angle prime 24mm f/1.4 lens is designed for use with full-frame Canon EF-mount DSLRs, however can also be used with APS-C models where it will provide a 38.4mm equivalent focal length. Floating internal focusing mechanism helps to maintain consistent image quality throughout the focusing range, from 9.8" to infinity. EF 24mm f/1.4L II USM Lens is rated 4.8 out of 5 by 288. Rated 5 out of 5 by Hawaii Papa from Stellar performer I had to send the first copy back because of back focus problems. I have never had a quality control issue with any of the dozen L lenses I have owned and used so I was very surprised to find the 24L II not living up to my expectations. The second copy performed flawlessly! This lens is better than the original 24L in every way: center and edge sharpness, chromatic aberration, smoother bokeh, weather seals, nicer build quality. It performs at least as good as the highly regarded 35L. No other lens will give you the unique look of wide field of view with the shallow depth of field. This is very close to a do it all lens and my new favorite. Rated 5 out of 5 by Jay D from Great Lens.... loving it... I went to calibrate AF and it was dead-on... no adjustments necessary. I am getting all the almost unbelievable claims made in advertising. Not using a flash and taking hand held night shots that are clear edge to edge and little flaring. Day shots are clear and flat and using 5D2 with built in lens compensation for vignetting, etc. but not noting anything. I show the photos to friends and their jaw drops. What else can I say? Focus is smooth, accurate in AF though I did mess up some night photos that I couldn't get a good long distance AF lock and so set to infinity... later determined out of focus. My own technical fault. No issues to report I am very happy with this lens. Rated 5 out of 5 by Nathan King from Best prime for a cropped sensor. Without doubt my new favorite all around lens mounted on my 7D. Extremely versatile for a walk around portrait lens, fast and bright for those low light, quick shots. Also does wonders as an adventure, hiking, camping prime, where you want to have the ability for artistic portraits with incredible bokeh, while having a wide enough shot to include some of the environment, adding to more story telling photographs than what you would get with a tight 50mm. On the cropped sensor therr is no vignetting nor distortion, making the lens even more versatile imo, at least in this instance. This will be the first and last lens on my camera, most of the time. Rated 5 out of 5 by Keenan from BEST WALKAROUND LENS FOR A FULL FRAME This lens feels very soild in the hands. The lens produces beautiful contrasting colors. You will be amazed with the images sraight out of the camera. The lens is sharp at f/1.4 for upclose portraits, but stop it down to f/2.8, and its as sharp as the Canon EF 135mm f/2L (which is Canon's sharpest lens). This lens is ideal for architectual,landscape, and enviormental portraits. This lens is the best walkaround lens for a full frame. Its more versable than a 28,35,and 50. Its better to include more into a scene, than have detail lost. And dont forgot its a f/1.4 lens, so its a low light lens (and Canon's fast wide angle lens), and beats out the 16-35 f/2.8L and the 14mm f/2.8L. Rated 5 out of 5 by hiprophoto from Easily bests the previous version in every way I had to send the first copy back because of back focus problems. I have never had a quality control issue with any of the dozen L lenses I have owned and used so I was very surprised to find the 24L II not living up to my expectations. The second copy performed flawlessly! This lens is better than the original 24L in every way: center and edge sharpness, chromatic aberration, smoother bokeh, weather seals, nicer build quality. It performs at least as good as my 35L. I highly recommend testing your copy first or buy from a dealer with a no hassle exchange/return policy. Rated 5 out of 5 by ZFototechnika from This Lens Is Worth Every Penny! I have been researching this lens for quit some time. I have seen many sample photos on the photography forums. The reason I decided to buy this lens was because of the versatility and sharpness of each shot. The auto focus is very fast and consistant. The colors straight out of the camera are very vibrant and need only minor adjustment in post processing. I am very happy with this lens and would recommend it to any professional or even enthusiast photographer. You definetly get your money's worth with the 24L II lens!!! Rated 1 out of 5 by MG from 24mm 1.4L 11 USM The lens I got was unusable at 1.4 to get a decent quality had to close down two stops. This now is the third time in one year I have returned L glass for sharpness issues. If you are a serious Pro I would advise never buying a high quality lens on line. Not that the vendors are bad, but you will not know what you get. Then you are faced with fees for restocking and shipping at you expense. Not all lenses are equal and seems like this is a new thing with Canon, As I have not returned or had a bad lens in the past ten years. Now three. So BEWARE JUST CAUSE IT HAS A L ON IT IT DOES NOT MAKE IT GOOD MINE WERE REAL DOGS. Rated 5 out of 5 by Anonymous from Razor Sharp Lens The sharpest 24mm that Canon makes. On my 5d ii, this lens provides an artistic wide angle view that creates depth of field that cannot be produced on any zoom lens. Bokeh is subtle from a distance...however, when shooting close to subject matter, the Bokeh becomes more drastic and dreamy. In my opinion, this lens is just as sharp as the legendary Canon 35mm 1.4. I have also used this lens my 7d. Focuses extremely fast on both full-frame and cropped-sensor. This lens is perfect for any photographer that needs something wider than 35mm that still needs better control of DOF. Amazing also for wedding, landscape and street-shooting photogrpahy. What Lee filter holder and Lee Adapter Ring goes with this lens? In terms of a holder and ring from Lee that will work with this Canon lens, you've got the LEE Filters Foundation Kit, B&amp;H # LEFK and the LEE Filters Adapter Ring - 77mm - for Wide Angle Lenses B&amp;H # LEARWA77. Below are some images of these items for reference. The Canon EF 24mm f/1.4L II USM Lens is compatible with the Canon EOS 5D Mark IV. The Canon EF 24mm f/1.4L II USM Lens is designed for use on the Canon EF lens mount, while the Sony Alpha a7RIII Mirrorless Digital Camera uses the smaller Sony E-mount lens mount. As such, you need a lens adapter to connect the above lens to your camera. If you purchase either the Metabones Canon EF/EF-S Lens to Sony E Mount T Smart Adapter (Fifth Generation), B&amp;H # MEMBEFEBT5, or the Vello Canon EF/EF-S Lens to Sony E-Mount Camera Auto Lens Adapter, B&amp;H # VELAESECEF, you may use the Canon EF 24mm f/1.4L II USM Lens, B&amp;H # CA2414L2EF, on the Sony Alpha a7RIII Mirrorless Digital Camera. Will this lens work on a Canon EOS Rebel T5 1200D? Yes, the Canon EF 24mm f/1.4L is compatible with the Canon EOS Rebel T5. Wil this lens work with all its functionality in Sony SLT-A77 II Camera? This lens, will make your T3i, a great camera, I have the T4i, and love it on mine. Camera bodies come, and go, but, good glass is priceless. Also, if you ever, upgrade to a full frame Canon camera, it will be perfect. This lens on you crop sensor gives a wider angle of view. I have the Canon EF 35mm f/1.4L as well, but, this is the lens I keep on my camera all the time I love it. I've also taken product shots of note cards I sell on my website. It's expensive, but, well worth it for quality photo results. Does this lens fit a Canon 5D mark III? Of course! Its a Full Frame Lens. Can the glass be replaced on this lens ? I'm sure Canon would be happy to replace the front element of this lens...at a price. I would recommend getting a Helipan UV Filter or a B+W UV Filter. Just screw it on and you can replace that as needed.